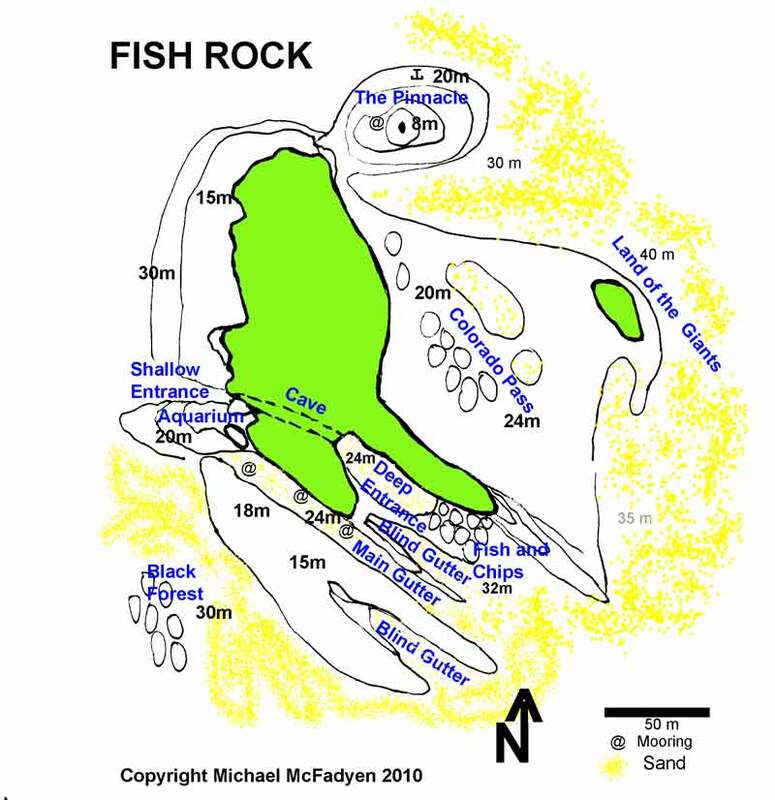 Michael McFadyen's Scuba Diving - Fish Rock - Fish and Chips While most people who visit Fish Rock want to dive Fish Rock Cave, those of us who have been there many times (I dived over 150 times here) want to explore other parts of the reef around the island. One of the dives that I like doing here is called Fish and Chips. This is the area to the east of the Deep Entrance Gutter that leads to the Deep Entrance to the cave. The eastern end of the cave is much deeper, being around 25 metres. 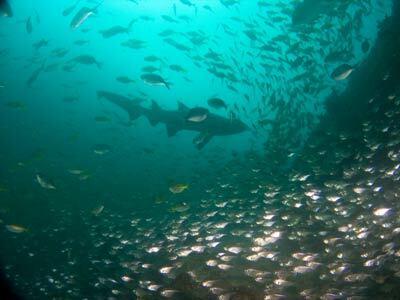 The gutter that runs out is home to grey nurse sharks and past this the fishlife is always prolific. This area is called Fish and Chips. 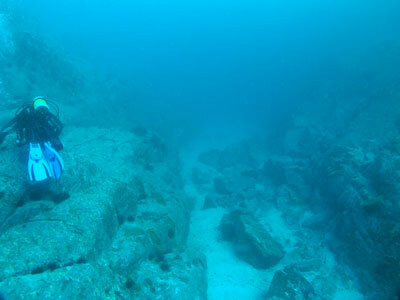 This dive covers the area from the Main Gutter right out to the ridge that runs to the east on the north side of the Fish and Chips site. 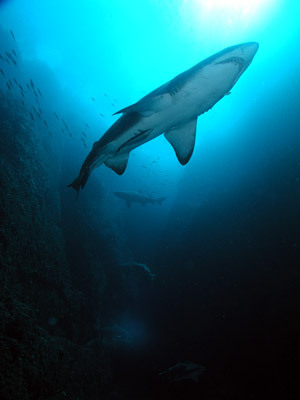 I normally start this dive by following part of the Shark Gutters dive, but you can vary it a lot once you know the area. From the mooring (all of which, no matter ths shop you use, are located in the main shark gutter), you descend towards the bottom of the gutter and swim south-east along the wall or rdige (depends on where you are). As you go along this gutter you will see that there are some very large black coral trees on the northern wall. The depth on the bottom at the north-western end is about 25 metres and if you keep going it will get to 30 metres or more. 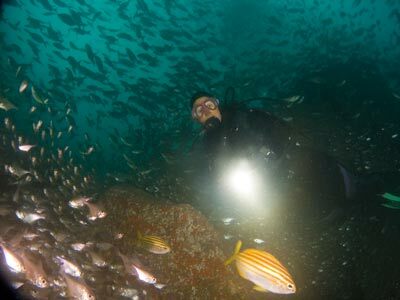 As mentioned, you can go right to the end of the guuter as per the Shark Gutters dive or go up over the ridge to your north at a depth of about 25 metres. 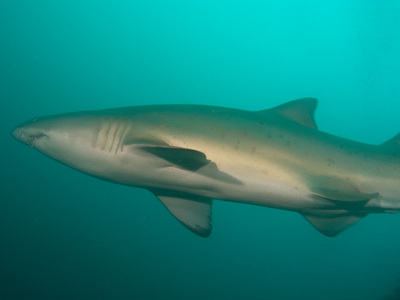 You should encounter a few grey nurse sharks in the gutter. You can also get your baot to drop you in the Deep Entrance Gutter and this can save a bit of time and air. When you cross over the ridge you will see another sand gutter here that comes to an end a bit to your left. This is called the Blind Gutter, but should not be confused with another one one south of the main gutter. There can also be grey nurse sharks in this gutter. There is also a huge black coral tree here. Continue over this gutter to the next ridge. You could also go south-east along this gutter to the end if you like. If you continue at right angles to the gutter you will come to the main Fish and Chips dive site. If you are a bit to the west, you will enter the Deep Entrance Gutter. If you see sand, turn right and you will hit Fish and Chips. You will see that there are some huge boulders here. 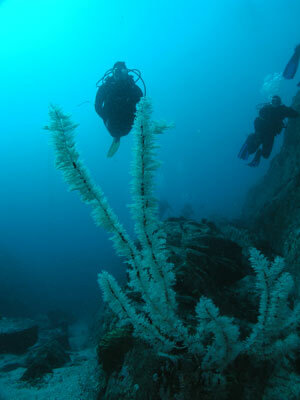 Around these there are normally heaps of fish and many wobbegongs. Sometimes you can be totally consumed by fish, mostly yellowtail, sliver sweep and ladder-finned pomfret. 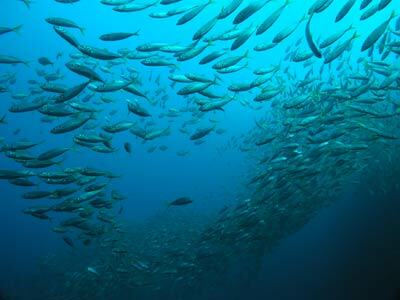 I have only ever seen this density of fish on the wreck of the SS Tuggerah (at 46 metres). At times you cannot see each other even though you are metres apart. When this happens, it makes a brilliant dive! Continue out to the east, following the very large wall that will be on your left (to the north). There are smaller boulders but the fishlife is just as good. 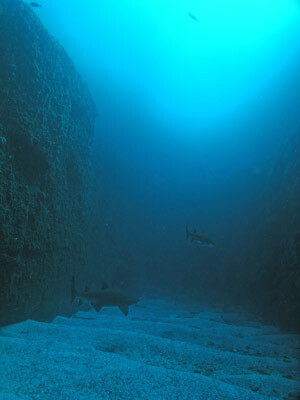 The depth out here can get to 35 metres. 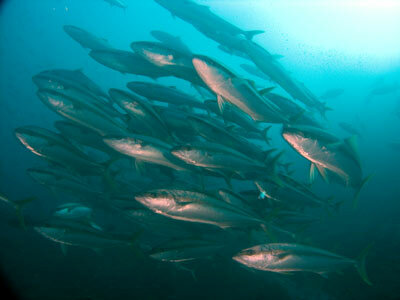 You can have huge schools of jewfish on the wall and large schools of huge kingfish oftern circle around you. 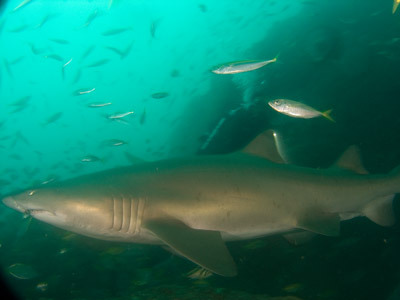 In between the fish, a grey nurse shark will almost certainly swim past you. When you have about half your bottom time left (or air), head back the way you have come. You will most likely need to head back to one of the moorings, so there are a couple of ways to do this. The first is to follow the main ridge back to the Deep Entrance Gutter and then going up this a bit if you have time before backtracking and heading south over the ridges and Blind Gutter to the Main Gutter. The second way is to head out over the deeper sand and rocks to the south and then south-west. This will bring you over the ridges and Blind Gutter to the start of the Main Gutter. There will be more grey nurse sharks in both gutters. Head back along the Main Gutter towards the north-west till you come to your mooring. If you have any time left, spend it around this area and do your safety stop on the wall to the north. This is a brilliant dive. 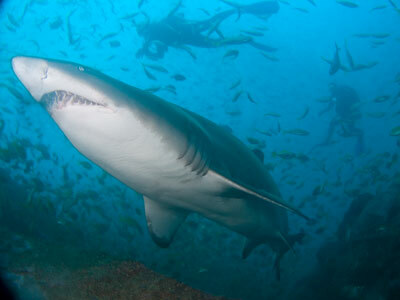 with grey nurse sharks, kingfish, wobbegong sharks, yellowtail, silver sweep, jewfish and ladder-finned pomfrets being seen on every dive. 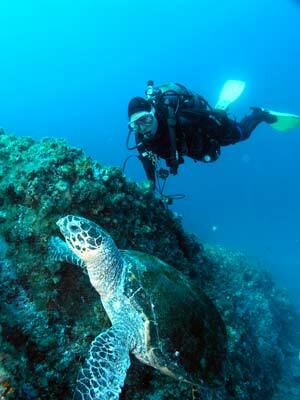 One of the most amazing dives in the World I reckon.